Biography: It was while he was studying for a law degree that Vijaya Raju was called by God in 1992 to plant a church in Vegayammapeta, a village in the rural area of Andhra Pradesh, India. Today the farming region where paddy rice, sugar cane and vegetables are grown, the village is home to 50 Plenty to Share churches, so named in 1997, with Vijaya Raju overseeing the ministry. Vijaya says he and his wife Grace, preach the Gospel "in and around our District and bring people to the saving knowledge and from darkness to the light of Lord Jesus Christ." Plenty to Share has cell groups of six to ten people in the evangelism, with each cell meeting three times weekly to pray for the needs of the group and healing of the members. Worship services at the churches includes song and "praising with tongues," he says. In addition to its core evangelism, Plenty to Share Ministry also conducts Gospel meetings, provides for widows through a care program and supports children's foster care. Summer Bible School, Sunday school, teachers' training and youth ministry and Bible clubs are also part of this dynamic ministry. 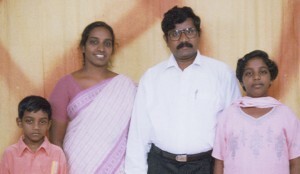 Strengths: Vijaya Raju and Grace's strengths lie in reaching those in need, and preaching the Gospel.